In June of 1939, the first National Contest of Aeromodels with Combustion Engines took place at Leipzig-Mockau. Arthur Sack, who dreamed of a circular-winged aircraft, entered his AS-1 model, but unfortunately, it had to be launched by hand and had poor flying characteristics. Ernst Udet, who was at the time Germany's Air Minister, encouraged Arthur Sack to go on with his research. 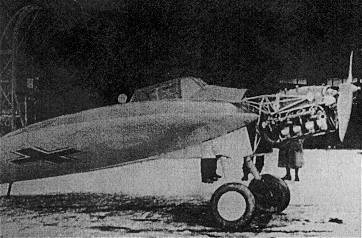 Sack built four additional models of increasing size, culminating with his first manned aircraft, the Sack AS-6. The AS-6 was constructed at the Mitteldeutsche Motorwerke company, with the final assembly taking place at the Flugplatz-Werkstatt workshops at the Brandis air base in early 1944. 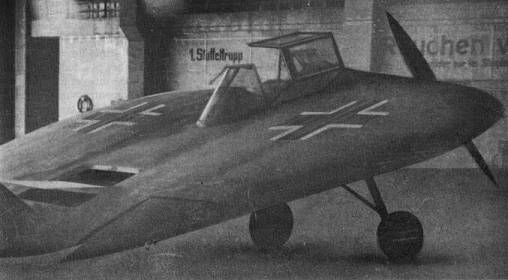 The AS-6 was a strange conglomeration from other planes, including the cockpit, seat and landing gear from an old, wrecked Messerschmitt Bf 109B and the Argus As 10C-3 240 horsepower engine from a Messerschmitt Bf 108 liaison aircraft. 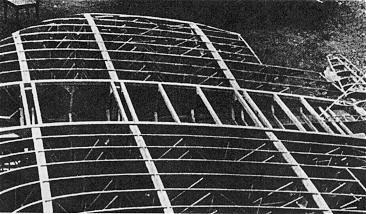 The wing assembly was new, with plywood forming both the ribs and covering. Ground taxiing tests were performed in February 1944, with the first test proving that the rudder was not strong enough and some structural damage ensuing. Five takeoff runs were made during the second test on the 1200 meter (3940') Brandis landing strip. During these tests, it was determined that the control surfaces were in the vacuum area behind the circular wing, and thus did not operate adequately. The right landing gear leg was also broken during the final attempt of the second test. It was thought that the problems arose due to the low power output of the engine, but because of a wartime shortage of more powerful engines, it was decided to change the incidence angle by moving the landing gear backwards by 20 cm (8"). 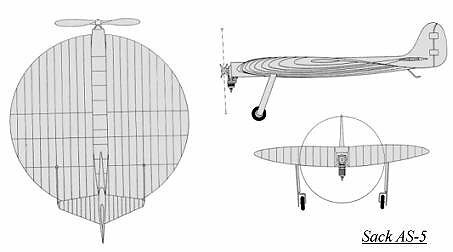 Since the next wingspar was located 40 cm (16") farther aft, it was purposed to attach the landing gear here, but this introduced the problem of having the landing gear too far aft and thus the plane could tip forwards on takeoff, destroying the propeller. 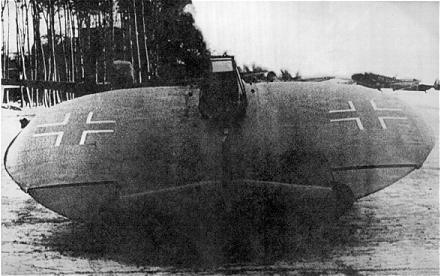 To compensate for this, brakes from a Ju 88 were installed, 70 kg (154 lbs) of ballast was added just ahead of wingspar number 3 and the tail control surfaces had 20 mm (3/4") of corrugated plate added. The third test took place on April 16, 1944 on the 700 meter (2300') Brandis landing strip. The plane traveled 500 meters (1640') without the tail lifting, although a small, brief hop was achieved. On the fourth and final test, the jump was longer, and the AS-6 became airborne, but an immediate bank to the left due to the torque of the engine became evident. The small span wings were too short to compensate for the engine's torque. The pilot recommended a more powerful engine and more wind tunnel tests, and Arthur Sack went back to the drawing board for the remainder of the war. During the summer of 1944, JG 400, who flew the rocket-powered Messerschmitt Me 163B "Komet", was moved to Brandis. 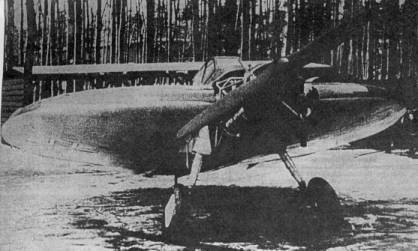 They found the AS-6 there and tried to fly it, but the only attempt resulted in a collapsed landing gear leg. The AS-6 was damaged in a strafing attack during the winter of 1944-45, and was broken up to salvage the wood. All that was left was the miscelleneous metal parts, and these were thrown into the aircraft salvage area. In all probability, this is why American troops who entered the Brandis air base in April 1945 found no traces of the Sack AS-6. 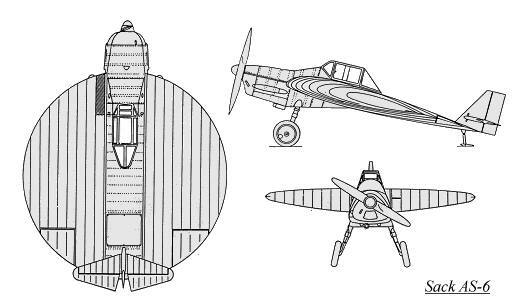 The Sack AS-5 model three-view drawing, this was Arthur Sack's last model before constructing the full-scale, piloted AS-6.